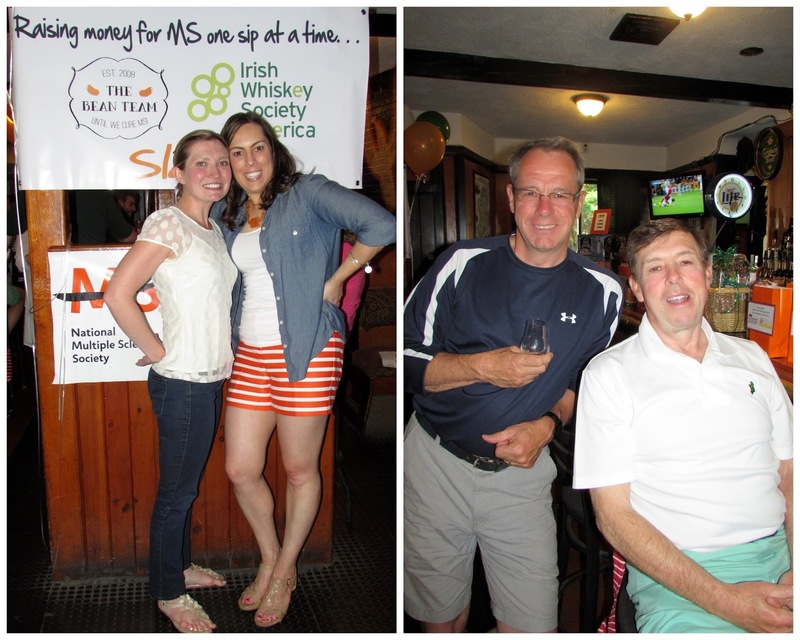 On Sunday night The Bean Team had a Whiskey Tasting Fundraiser for MS with the Irish Whiskey Society at Lower Mills Pub. Personally I am not a fan of whiskey but I am a fan of creative and unique fundraisers and I think this is something new and different. Plus I may be related to the VP of the IWS so I had an in! My brother Allan was all for partnering with The Bean Team for this event and we threw the whole thing together with the help of a few others. . . 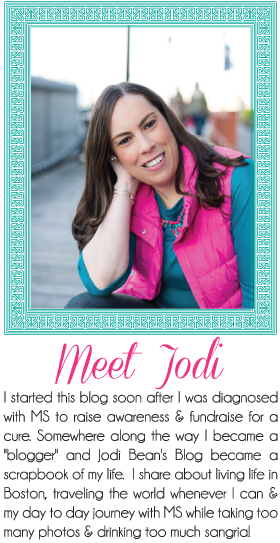 I made this banner on easybanners.com and I am in LOVE with the way it came out. I'll have a full review coming in a separate post soon. I made these two DIY garlands. The one on top with the beans and shamrocks was super easy to put together after my coworker used her special cutting machine to make the shapes. I just had to string them together. Then at the last minute I decided I needed a tissue paper garland and it was my first time making one. It was SO easy and quick. I went on pinterest and read a couple of posts on how to make them and then did it. I can't wait to make another one! The food spread was excellent thanks to the generosity of a few local stores. The new Wegmans in Chestnut Hill donated a $100 gift card and I was able to get all of the sandwiches and veggie tray there. The Whole Foods in Brighton donated a $100 gift card and I was able to get the macaroni salad, potato salad, cole slaw and fruit salad. Big Y in Franklin donated a $25 gift card and my mom picked up the chips, pretzels and pickles. My mom also made deviled eggs (not pictured) and I made chocolate chip cookies and brownies for dessert. My aunt made Irish Whiskey cake for dessert too because you can't have a whiskey tasting without a whiskey dessert! Everyone gave two thumbs up for all of the food. 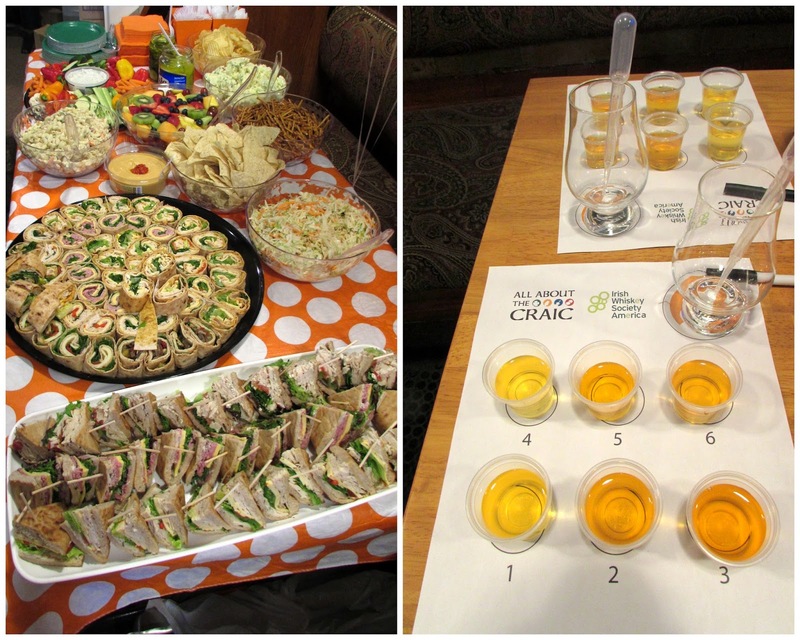 Everything was delicious and the majority of the food was gone by the end of the event. Food can get very expensive when hosting fundraisers so when you can get the majority of it donated it makes a BIG difference. I'm so thankful to these stores who donated so I could keep the costs down for this event. As you can see from the above photo not everyone loved all the whiskeys! Luckily everyone had fun despite this and could still enjoy a beer from the bar! Rich, the President of the IWS, led the tasting and provided great information and history about whiskey. He also had a quiz just for fun to see who knew the most about whiskey. Rich did a great job leading the tasting despite a lot of chatty tasters. Everyone was having fun and may not have been listening as well as they should have. 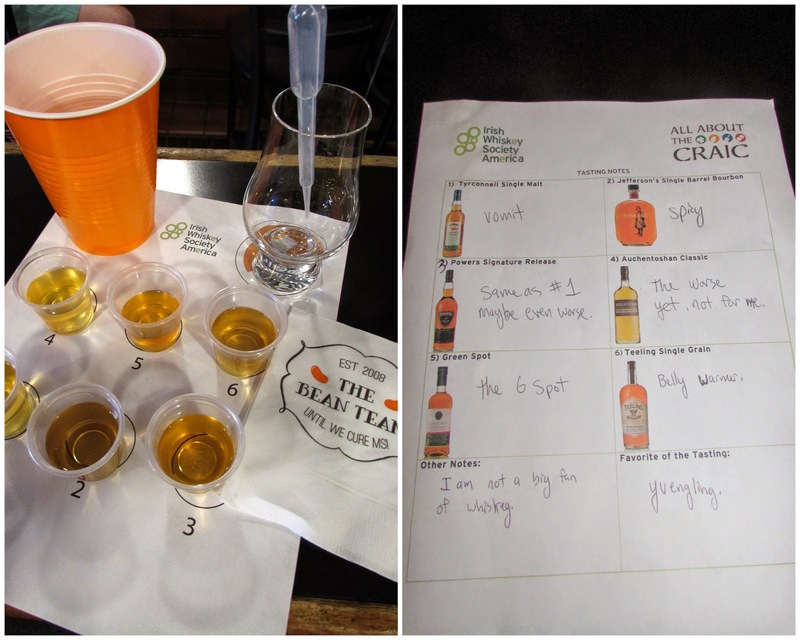 Drinking whiskey = chatty tasters! Photos of most of them below. See for yourself. . . they all look innocent but believe me they were drinking, talking, laughing and enjoying the USA World Cup game. 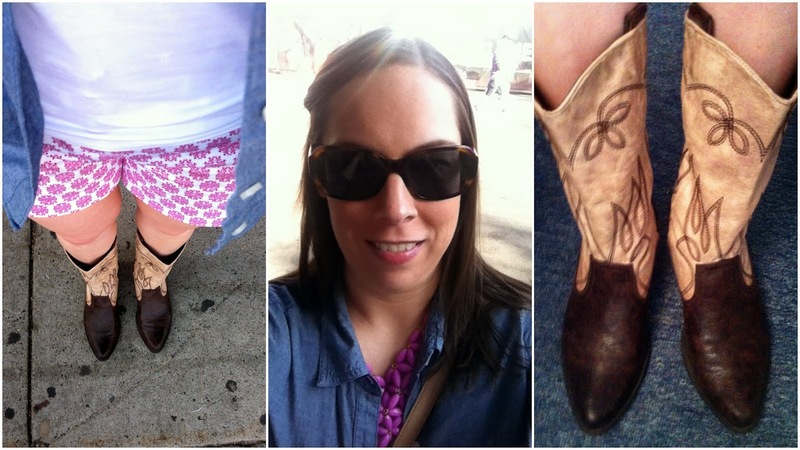 . . all while raising money for MS. . . win, win! Chris is responsible for the "key" I posted above. He is not a big fan of whiskey and his comments gave us all a good laugh! He is a great sport! 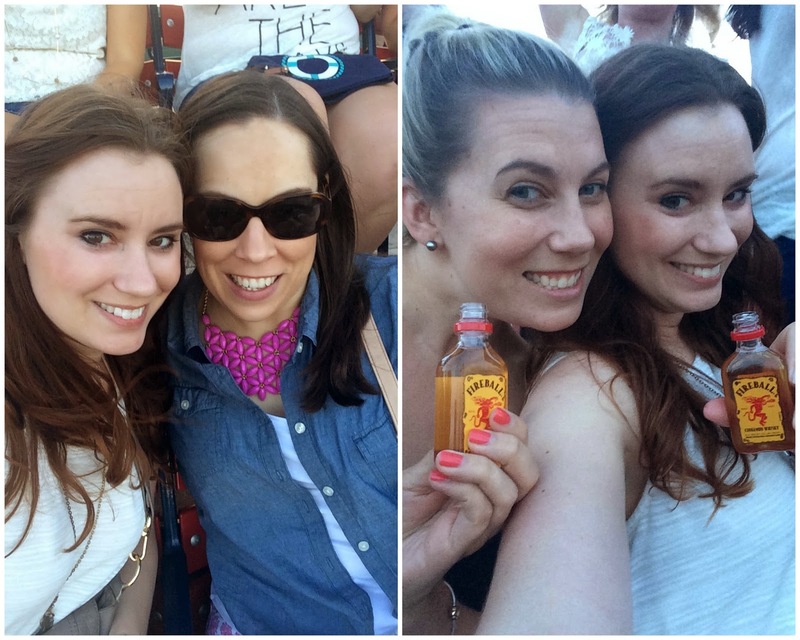 The lovely lady in the middle is pregnant and was not tasting the whiskey! She was just there for moral support! My friends Missy and Emily were tasting and had plenty of extra. My parents are always so supportive of everything I do including these fundraisers. My mom was a huge help with picking up some supplies, making the raffle bag labels, loading and unloading the car, making the deviled eggs and more. So thankful for all of their help (especially since neither of them even like whiskey)! After the tasting part of the event we all just hung out and mingled while watching the rest of the USA World Cup game. None of us could believe our eyes when Portugal tied the game with only seconds left. So disappointing! Luckily we still had raffle prizes to look forward to and I was able to make several people happy by choosing them as winners of these GREAT prizes! 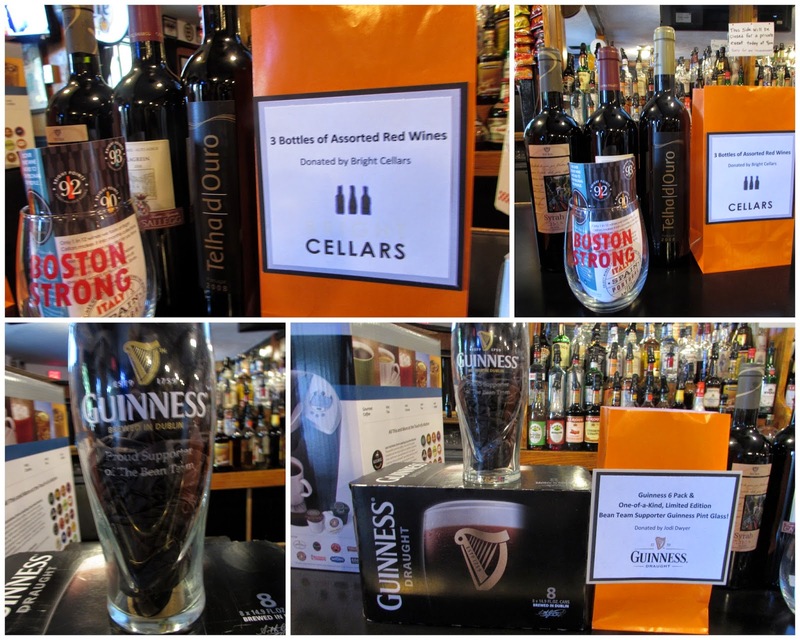 Bright Cellars donated 3 bottles of wine and I donated this 8 pack of Guinness with a custom pint glass that had "Proud Sponsor of The Bean Team" on it. 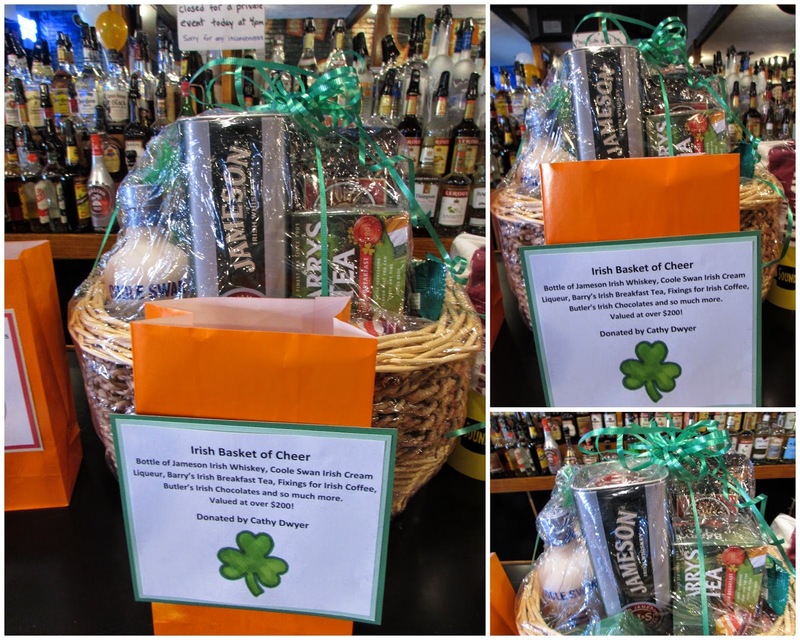 My aunt Cathy put together this amazing "Irish Basket" filled with things she bought while she was in Ireland last month. It had a bottle of Jameson and a bottle of Coole Swan Irish Cream as well as a ton of other stuff. It was worth over $200 bucks and the guy who won, James, was pretty happy! Thank you Cathy for donating this basket. There were a lot of raffle tickets in that bag so definitely a big hit! 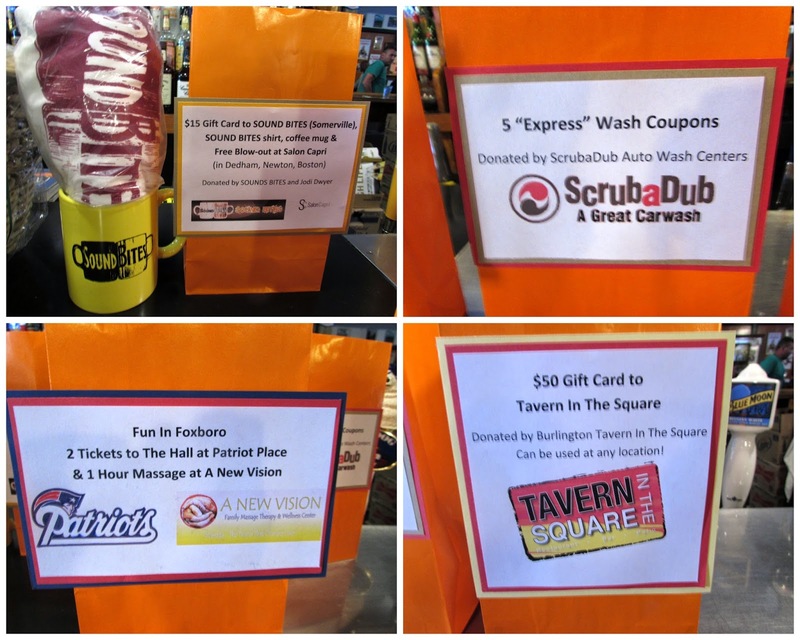 Sound Bites in Somerville donated a gift card, mug and shirt, Scrubadub donated car washes and Tavern In The Square donated a $50 gift card. I had received the Patriots' museum tickets and massage gift card somewhere along the way and finally included them in a raffle at this event! 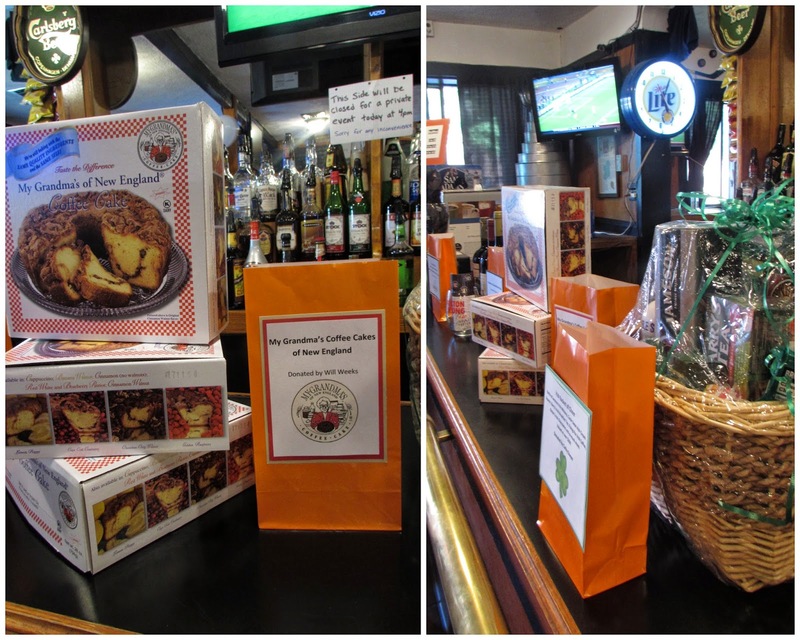 My Grandma's of New England donated enough coffee cake for two winners to each take home three delicious cakes! 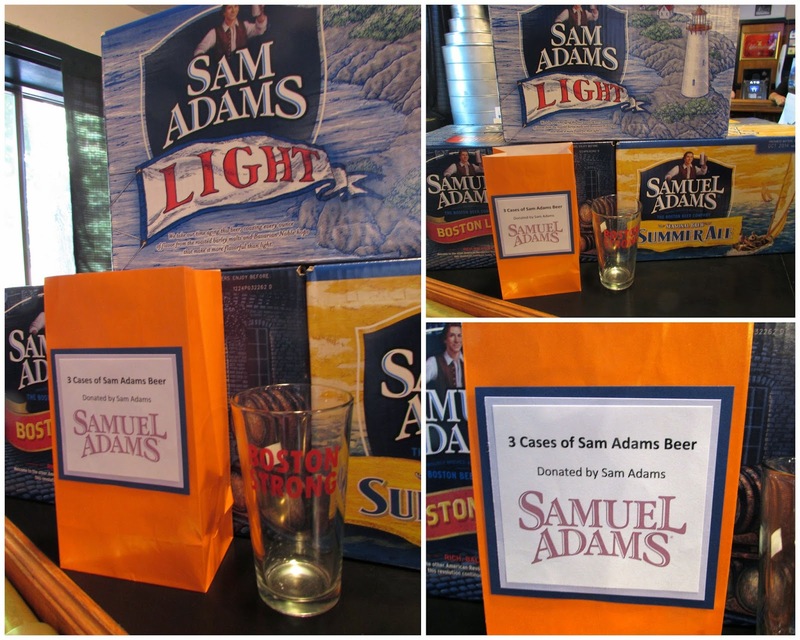 Sam Adams has donated to me a couple of times now and they are always so generous. They donated 3 cases of beer and my uncle was the lucky winner of this prize. He went home happy! The Keurig was probably the most popular item of the night. The bag was filled with the most raffle tickets and the winner was very happy to be taking this home. Thank you to Keurig for donating 4 of these to me to use at our events! They have really helped us to sell more raffle tickets so I'm so appreciative of this donation. Some of the happy winners!!! I also want to give a big THANK YOU to the Lower Mills Pub. This is the second event we have done there. 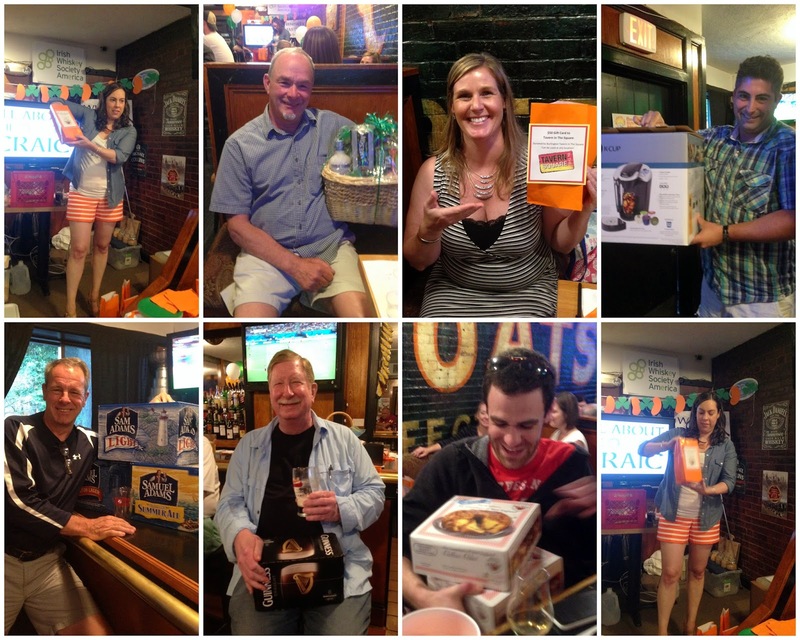 We did the Trivia Fundraiser for MS back in March and the location and staff were so great we decided to work with them again. They donated the space for both events which was a huge help. These flags are hanging on the walls in the pub and I thought they were perfect for our event! I also can't forget the IWS. Without them this event would not have been possible. Not only did they donate ALL of the whiskey but they came up with the theme and provided all of the other supplies needed. 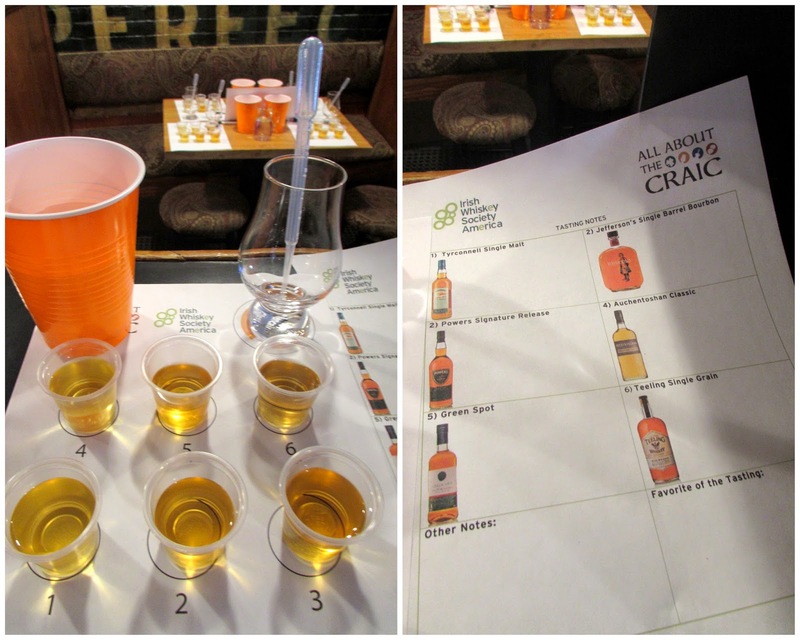 Of course they also led the tasting and taught everyone there something new about whiskey! This event was so much fun! I never expected to have such a good time at a whiskey tasting since I don't even like whiskey. 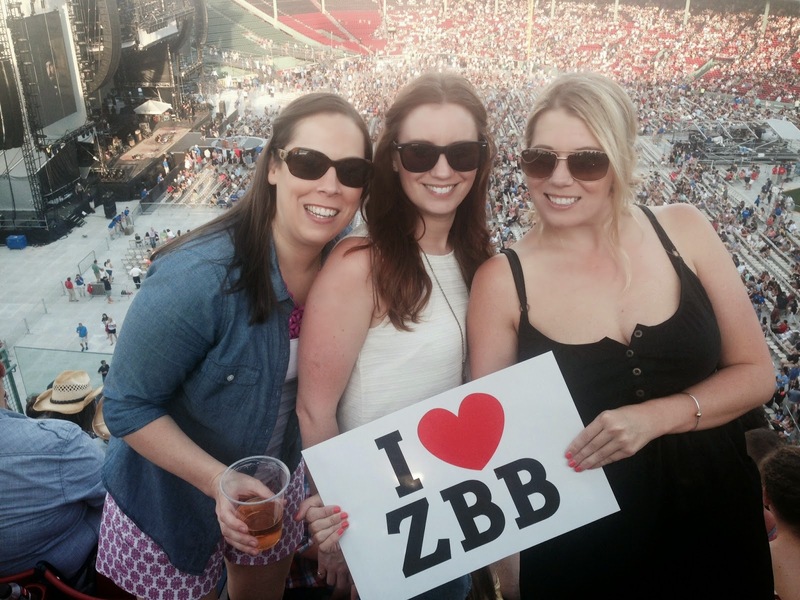 But you get good people together for a good cause and a great time is sure to be had. Everyone there was so generous and bought a lot of raffle tickets including the bar tenders and some of the locals who were hanging out on the other side of the pub! I know you are all wondering how much we raised right?!?!?!? Well I won't keep you in suspense any longer. We far exceeded my expectations and raised. . .
Can you believe it? Amazing right!? This was after expenses and as I mentioned above our expenses for this event were very low since most everything was donated. I only had to buy the paper products and balloons and even Party City gave me a 20% discount. 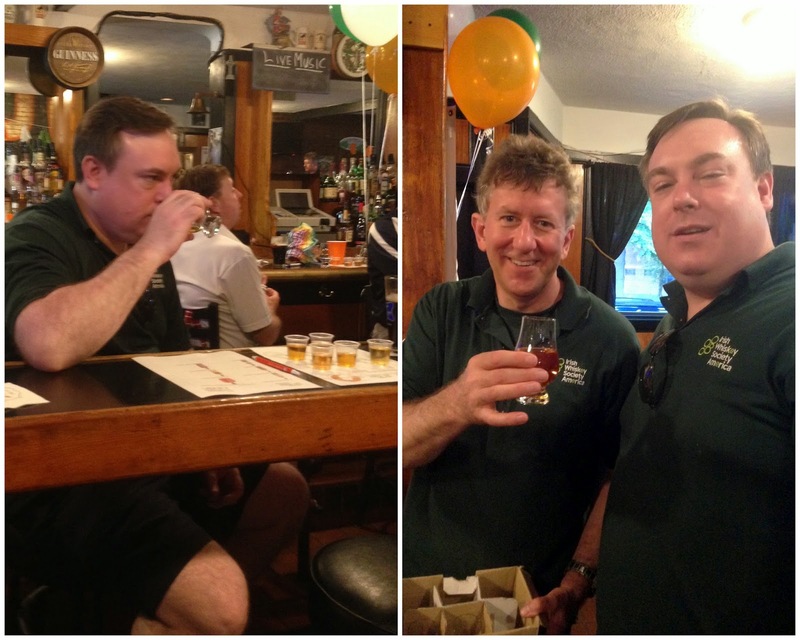 I'm also happy to share that both the Irish Whiskey Society and the Lower Mills Pub are official Bean Team "Faith" sponsors and their logos will be on our shirts one day of the MS Challenge Walk! If your business is interested in being a sponsor please contact me for more details. I have a confession to make. . . I'm both extremely tired of organizing/planning fundraisers and strangely addicted to organizing/planning them all at the same time. Is that even possible? I feel like fundraising is a full time job and the majority of my free time has been devoted to fundraising for months. I'm ready for a rest but I also love the thrill of seeing that final amount and knowing all of the hard work paid off. It is amazing how much you can raise when a group of committed, generous people come together. Thank you again to all of the businesses who donated and to all of the friends and family who attended. That amount above would not be possible without you! Are you on Facebook? Please go like The Bean Team to keep up to date with our fundraisers! You can also like the IWS and Lower Mills Pub!